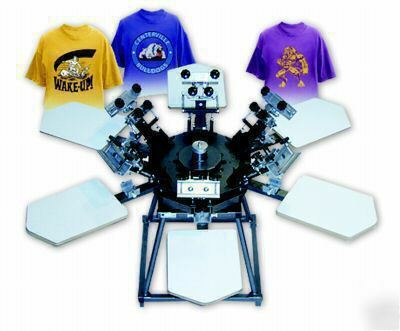 WORKHORSE ODYSSEY MODULAR 6400, 6-COLOR, 4-STATION (UPGRADEABLE TO 6-COLOR 6-STATION) MAX SCREEN WIDTH 23"/58CM. PRODUCT FEATURES: LARGE DIAMETER CENTER SHAFT WITH TAPERED BEARINGS. STURDY TUBULAR STEEL CONSTRUCTION. FINE THREAD MICRO REGISTRATION. ADJUSTABLE OFF-CONTACT. ADJUSTABLE SCREEN ANGLE. LARGE DIAMETER REGISTRATION POINTS. OPTIONS- ADDITIONAL PRINT HEADS, PRINT STATIONS, AND PALLETS.